In our last edition of the Chronicle, grand accusations were made against the current number one ranking league, Destiny. These accusations, as expected, did not go over well with the rank and file troops of Destiny, nor their leadership. Taking to the public forums, the Marshal of Destiny lashed out against the accusers and called them to account for what they said about his members and his league. 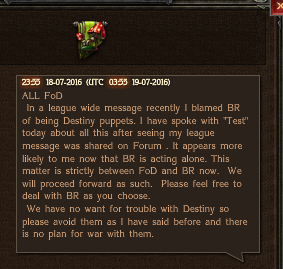 In this lengthy post, Test defends his league and dismisses the claims that the Fellowship of DaM has made against his league. Calling on the Fellowship to explain their accusations he calls them out and demands an answer to his questions, otherwise they risk facing war. 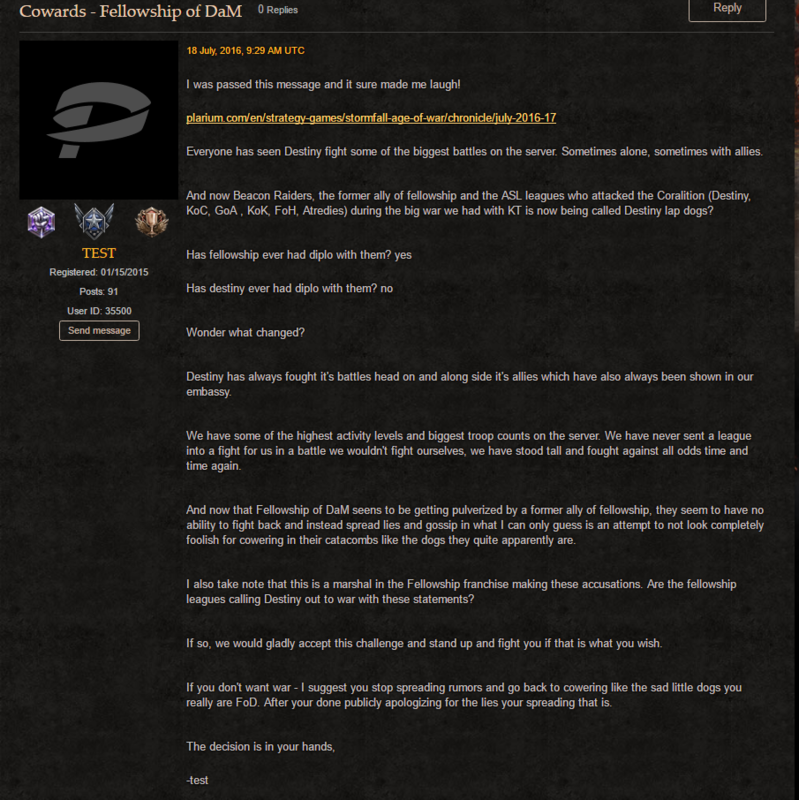 Adding to the confusion, a number of images are added to the conversation, which seem to back up the Fellowship of DaM's claims, which consist of a league-wide message and an internal message posted by the Beacon Raiders, the league at the center of this controversy. It is unconfirmed whether or not that Anarchy or Destiny are true allies of the Beacon Raiders or not, but this claim has been dismissed as untrue by the leadership of both leagues. 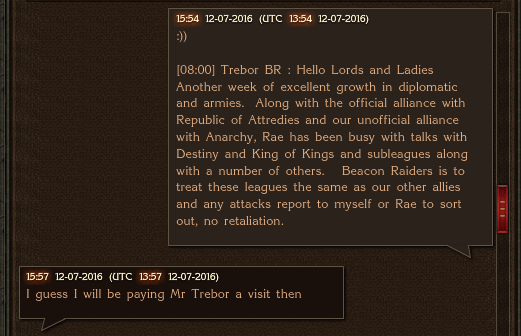 Test stated on the forums that there are in talks, but nothing has been established, as is suggested by the Beacon Raiders in the above two images. After talking further, the escalation of force has been brought under control and the claims have been dismissed as rumors only. Confirming this, the Marshal of the Fellowship of DaM sent out a league-wide message, telling his members that he was wrong in his accusation and that they would not be going to war at this time with Destiny. For now, the risk of war has once again been put on the back-burner, but it is only a matter of time before another drama unfolds somewhere across the realm that simple words cannot settle. At that point we will once again face war and all the chaos that comes along with it. Until then citizens, be safe and stay alert.